B&B Dei Cappuccini and B&B Jonella is so well located that you will not be short of places to visit within walking distance of your accommodation. We have included for you interest a selection of monuments and attractions that are well worth the visit during your stay. It would be hard to miss the fashionable Via Veneto considering it’s proximity to our Bed and Breakfast. Considered the most handsome street in Rome, Via Veneto is famous for it’s ‘Dolce Vita’ days in the 1950’s when the street was often portrayed as the mecca for trend-setters, the rich and the famous. True to it’s origins Via Veneto is still the playground for celebrities and wealthy socialites who retreat to the many prestigous hotels which adorn it’s pavements. The via has a wide selection of dining options with cafès and bars every few steps for those wishing to relax and watch this bustling street. 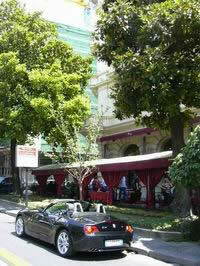 Via Veneto is also home to the American Embassy, the famous Harry Bar,Hard Rock Cafe and the Grand Caffè. There could be no better place to soak up the Roman atmosphere than at the nearby Spanish Steps. From our Bed and Breakfast all you have to do is walk to the end of the road, up the Via Della Sisitina and you will find yourself at the top of the spanish steps. From here you have wonderful views of the predictably busy piazza below and the Via Condotti famous for it’s designer shops. At the top of the ‘scalinata’ you have the picturesque church ‘Trinità dei Monti’ from where the most beautiful women and men gathered in the 18th century in order to be chosen from one of the many artists painting out in front of the church. As the seasons change these famous steps keep up with their environment and in May are adorned with vibrant pink azaleas, perfect for photo opportunites. To the right of the stairs there is the memorial museum which was the house of Keats and Shelleywhere John Keats died in 1627. You can visit the museum from Mon- Fri 9am – 1pm and 2.30pm to 5pm throughout the year. With your bed & breakfast so close by the Spanish Steps are accessible for evening strolls and dining without worrying about how to get back to your accommodation at the end of the evening. 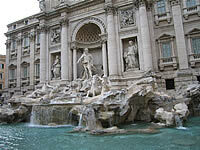 With so many fountains in Rome it is difficult to define which one may be the most beautiful but it cannot be disputed that the Trevi Founatin has become the most famous! Finished in 1751 definitively after many years of interrupted work this fountain has become a tourist mecca and a great photo opportunity. The architects are Pietro da Cortona, Bernini and Nicola Salvi. At the centre of the fountain is the rather prominent figure of Neptune, God of the sea. He is riding a chariot pulled by 2 sea horses guided by tritons. One horse is causing problems while the other is calm and tranquil, this was implemeted to depict the changing moods of the sea. It has become somewhat a tradition to throw a coin over your shoulder ino the fountain to secure your return to this beautiful city. Probably the closest to the Bed and Breakfast and most particular of Rome’s attractions is this Capuchin church dedicated to the Blessed Virgin Mary, this church is also known as ‘Our Lady the Immaculate and ‘Church of the Capuchins’. This church has become of particular tourist interest due to the fact that it has furmished the ossuary of the Capuchins completely in bones. From 1528 to 1870 friars serving the church were placed in a vault following their death and after some time the bones were retrieved to create this room of bones placed in a macabre style.